the Russian border with northern China. Petropavlovsk PLC started processing refractory gold concentrate at the new Pressure Oxidation (POX) Hub at its Pokrovskiy mine site in the Amur region of far southeast Russia in late November. 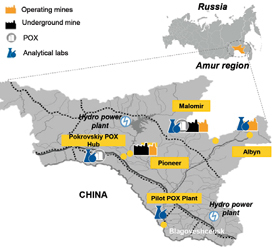 The company has three active mines in the Amur region: Pioneer, Malomir and Albyn. The Pokrovskiy site is mined out. The new POX plant benefits from the site’s infrastructure, including the processing plant building. Initial POX processing was through Autoclave 1, the first of four autoclaves that will be installed in the plant. Commissioning of Autoclave 2 was under way in late November, with processing of concentrate planned to begin before year end. Autoclaves 3 and 4 are scheduled to launch in the second quarter of 2019. Petropavlovsk has 20.86 million oz in JORC-compliant gold resources. Approximately 46% of the total is refractory, so the new POX Hub will play an important role in the company’s future production. Its gold production in 2018 was forecast to be in the range of 420,000 ounces (oz) to 450,000 oz. When the POX Hub is fully online, the company anticipates production will increase to a range of 500,000 oz to 550,000 oz per year (oz/y). The process of sulphide oxidation in Autoclave 1 was working well, achieving gold recovery of 93%, close to design recovery of 98%. The high recovery showcased the ability of the facility to effectively process the metallurgical complexities contained in refractory concentrate from the Malomir mine. The resulting pulp is being processed using conventional resin-in-pulp technology at the recently refurbished Pokrovskiy plant. The first gold doré pour was expected before year end. Petropavlovsk CEO Dr. Pavel Maslovskiy said, “Today’s announcement marks a significant moment in the company’s history, as we begin to process our refractory ore via the newest and most technologically advanced POX processing facility in Russia, a month ahead of schedule. There remains considerable work to be undertaken before we can reach full capacity; however, this initial performance is hugely encouraging for the company.